Television | Bostin' Ride Online booking for our 2019 events are now OPEN! Enter online now! 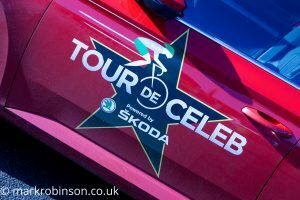 In 2016 we were contacted by a television production company who were interested in featuring us in a celebrity cycling challenge programme, that they were producing for Channel 5, which became their "Tour de Celeb" series. 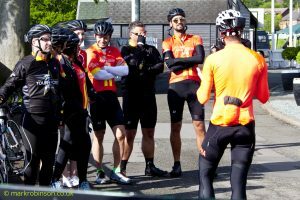 We were told that the concept behind the show was that their six non-cycling celebrities would be filmed whilst they trained to take part in the Etape later the same year but that they also needed to take part in various challenges en-route to record their progress to fitness. Their first challenge was the Silver Route of our Bostin' Peaks Sportive, through the Peak District. We were delighted to welcome them all, except Jodie Kidd who had injured herself on a team-building challenge before the day, and their extensive production team to Uttoxeter Racecourse for their first filmed long ride and many of our riders had a great time riding with and chatting to the celebrities on the course during the day. Needless to say that some celebrities performed better than others! It just goes to show that you never know who will be there at a Bostin' Ride event! Bostin’ Peaks – Angellica Bell, Louis Spence, Darren Gough, Amy Williams, Lucy Mecklenburgh, Hugo Taylor and Austin Healey – all ready for the off!